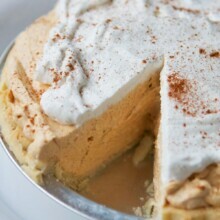 In a large bowl, whip cream cheese together with sugar, vanilla, pumpkin and spices until completely smooth and creamy. Scrape sies and mix again. In a separate bowl, whip heavy cream with powdered sugar until stiff. Fold in half the whipped cream into the cream cheese mixture and pour into baked pie shell. Top with remaining cream and sprinkle with more cinnamon, if desired. Refrigerate until ready to serve.